Engine/Moteur. Single cylinder Lombardini LDA 100 – Diesel 4 stroke. Alesage 100 x course 90, 18cv, 707cm3. 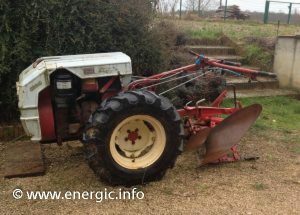 Energic 318 Motoculteur diesel . Starting. Electric starter, via battery 12v 30 amps, lights a option. Gears. 6 forward and 1 reverse. Speeds. ranging from 1kmh in first to 14kmh in 6th, with 2 or 4 kmh in reverse. PTO. 2 Rear independent @ 540t/m at 3000t/m and Synchronized with the gears between 500-700t/m. Energic 318 Motoculteur diesel rear view. Brakes. Independent each wheel or combined, drum. Wheels. 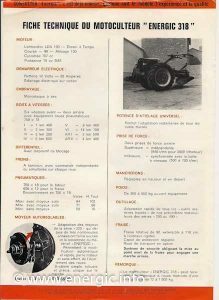 Pneumatic Tyre wheels 750 x 18 front. Option of 600 x 12 with the Cutting/fraise option. Width can be changed with minimum effort across a large range. (as per Energic series 220 Moyeux Autoreglables system). Hitch. Breveté system S.G.D.G. (patented in France and the UK) articulated strengthened bar with universal fitment to all ancillary equipment. 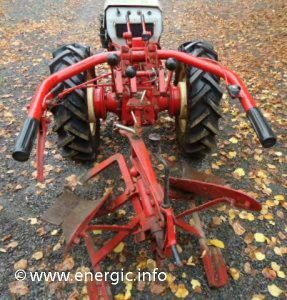 Enabling the adjustment of draft and other characteristics required to operate the implements at different depths. Can use all equipment from the 200 and 400 series Energic motoculteurs. 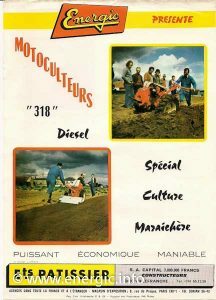 Energic 318 Motoculteur diesel brochure. 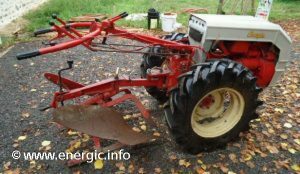 Hay – grass cutting/Fraise option. Rotaitive upto 1.10m width.Cutting blade rigid, outer protection regular-able, wheel for transport option, system security with neutral gear being selected before reverse gear can be selected. 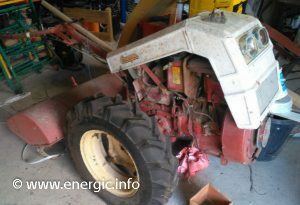 Energic 318 Motoculteur diesel ready for restoration.